I don't write very often. The rest of you are so much better at it than I am -- so I love tweeting to your great articles. (Thank you to all who provide great content and tweet it so we can help pass it along!) But today I couldn't *not* write, after reading Pastor Kevin DeYoung's article for leaders who feel unsure about progress toward their life's work. So let me offer the following. It came to mind yesterday as I was meeting with a handful of driven Christians, some from the evangelism sphere and some from the (Christian) emergency response sphere. Puerto Rico has been in the throes of hurricane pain. Many are responding, doing their best to come to their aid. Among people's many needs *water* is the primary need (as in many disasters). Thus FEMA measured the percentage of Puerto Rico's population who had access to drinking water. It's not the only need, or the only process needed. But water sustains life! Thus the water metric concretely symbolizes the urgent state of progress. Or to paraphrase Pastor Rick Warren: "If your mission statement isn't measurable, it's just PR." "Go into 100% of the world... making disciple(r)s."
Not just *some* of the world. Or some of the city. Or even just some of the neighborhood. ALL. 100%. So where'd you go? And how's your going, going? Of the many elements of making disciple(r)s, giving our friends & neighbors access to the *water-of-life* is most key. So, pastors... in your church's defined neighborhood, what __% of those household have had an optimal opportunity to hear/see the Good News of the *water-of-eternal-life*? And if indeed The Church is its people, let me ask all of you as well: Where did you go, and how's your going, going? What __% of your neighborhood households have been given access to this *water-of-eternal-life*, through a loving Christian friend? 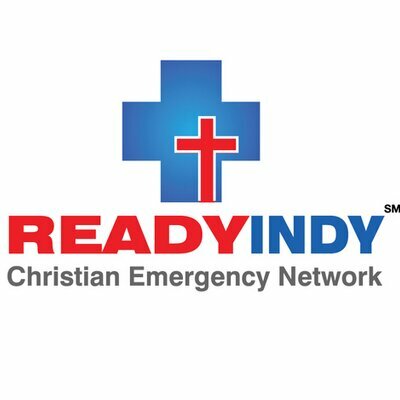 ReadyIndy is helping area congregations to think through their readiness capabilities. Just about 'emergencies' and 'disasters'? No, daily readiness. And team readiness. For prayer, care & share(ing the Good News). That is, for daily effectiveness in carrying out the Great Commission in our city's neighborhoods. Our God is WORTHY of 100% of Indianapolis' praise! Our Indianapolis friends & neighbors DESERVE to have an optimal chance of knowing Christ as Savior, Lord and have peace with Him forever! Ok, so how DO we reach our congregations in 60-seconds... for free? But btw, your people do NOT have to get an account to accomplish the following step. Ok, that's it. Now they will get your tweet(s) within 60-seconds as a TEXT-MSG on their phone. They don't even have to have a smartphone. It could not be simpler. But of course, to maintain your congregation's trust and attention, you'll want to develop a reasonable rhythm of communicating with them in this manner. In this case, you'd want to set up a special Twitter account for ONLY NOTIFICATION PURPOSES... eg, @ReadyIndy_notify ... and ask your congregation to turn that account on, instead. I'd be glad to hear your comments, thoughts and questions. You can easily reach me by emailing me at 'Coach@IndyChristian.TV'. Friend me on Facebook.com/IndyChristian. Or follow me on Twitter as @IndyChristian. Or even just call me -- I'd be glad to hear from you... 317-490-1255. Btw, here's a friend of mine who's particularly helpful among North American Muslims here in Indianapolis. You'd enjoy getting to know him. It's yet another great national event which has come to Indy... the Christian Sports & Recreation Ministries summit. I'm looking forward to participating on a panel discussion re social-media. IndyChristianMedia.com -- our concerted effort to connect a citywide communications network. Twitter.com/IndyChristian -- my individual twitter-ID. Twitter.com/IndyChristian/Driven-Christians - 500 Christian Hoosiers (& wannabees *wink*). [This one has become to popular that we've even assigned a domain-name to it... DrivenChristians.com. Twitter.com/IndyChristian/IndyChurches - another example of how to use a twitter LIST-feed to aggregate tweets by groups of people or organizations. Twitter.com/IndyChristian/CommTeam - this is 'the team' that I work most closely with; I follow them above all others, on at least a daily basis. Isn't that what any sports-team coach would do? 'Dashboard'... a one-pager re my social-media workflow to promote a given EVENT. @IndyTimeline... a twitter account, whose profile-link goes to our consolidated EVENTS listing, using a simple Google Document, thus easily formatted for bookmarking on your smartphone so you'll have it at your fingertips all the time. @IndyTimeline is a great example of social media helping develop collaboration citywide. And lastly... CityReaching.com, as an example of a great connecting ministry, and how they encourage you to 'Push Our Social Buttons'! I read a ton on the internet every day, and try to get through my Bible every year... so I have little time for popular books. I made time for this one. Why? I like well-researched information. I've followed @EdStetzer since he became the head of Lifeway Research. When he tweets, 25,000 people listen. When his co-author and boss @ThomRainer (President, Lifeway) tweets, 50,000 people listen. And these days, the mere mention aloud of the word 'transformation' gets the attention of our driven Christians here in the Racing Capital of the World: we're thirsty to see evidence of real change resulting from the mission of the Church. According to other research, only 9% of Americans hold a 'biblical worldview'. If applied generally to the 400 Hoosiers who die weekly in our metro area between sermons, that means 364 are dying without such a perspective. And our cities look like it. Something has to change. And that something is us -- the Church. Stetzer & Rainer aren't out to bash the church, but rather see it thrive. They clearly love the Church. And are now pointing us to key factors that characterize 'transformational churches' -- ie, those who are making a difference in lives & communities. "Few churches use any system of accountability today. Many North American Christians perceive church-wide accountability as intrusive and overbearing. But we can only expect what we inspect. If leaders don't take a close look into the lives of believers, they should not be surprised when there is nothing worth reporting." Stetzer & Rainer recite the three B's from the 'old scorecard'... "bodies, budgets and buildings"... which they allude to as the 'gold standard'... in need of revision. In their research, they selected churches by using an assessment algorithm that valued (at least some) growth, high rates of small-group participation, number of new commitments to Christ (per attendee), percentage who have then become active in the church, adults with regular responsibilities in the church, percentage of their adults actively serving in the community, and those churches whose constituents are regularly hearing reports of changed lives. Moreover, the authors realize that this 'new scorecard' must go beyond measuring the tangibles to also measure some intangibles... suggesting these are some of the very things that make a church a church... eg. 'relational intentionality'. And at its core... worship. "The motivation to see people of all nations become disciples of Christ is rooted in their desire to see God receive the honor He deserves." Stetzer & Rainer, both pastors, then explore some very keen insights about how TCs tend to worship. I'd love to share them here, but this chapter alone makes the book worth its price... $15. And I've only touched on a few of its gems; there's so much more to be said. So let me just say 'Transformational Church' will someday be regarded as a classic, having re-focused the American Church on our mission. Since TC deals primarily with traditional churches of 50 or more, and presupposes active small groups, what if your 'small group' is your 'church'... and worshiping in your home? Or expect to hear about Stetzer talking to your neighbor: "How's the church doing with Christ's command to 'love our neighbors as ourselves'... 1 to 5 stars?" And digging through outcomes data, validating community transformation. And if we've not yet researched Hispanic, Asian and African dynamics, what is yet to be learned from other cultures not only present next door, but also among #multicultural churches? And won't a 'community scorecard' press us toward the obvious: our need for 'excellent teamwork' among the larger body of Christ in our communities? Expect to hear those stories. Sorry; you can't buy that book yet. But you can buy this one and get started today. Often a 'book' can accomplish way more than all the church-parking-lot discussions in the world. Transformational Church is one such book. So don't just buy it for yourself -- buy several copies to give away to the world-changers around you. P.S... September 7th... a special Transformational Church webcast. Free. Indeed I'll pray for President Obama... notably that he rules with justice & mercy... and that he's successful in bringing about 'change'... especially for those who need it most. I'm praying that he'll use his every opportunity to defend the most defenseless in our land -- children not yet born and relying solely on the whims of their mother to keep them alive. I'll pray that he models godly wisdom, acknowledging primarily the God in whom we live and breathe and have our being... and that under Barack's watch, every American will have an optimal chance to know Him and have reconciling peace and redemption thru His Son. And that as President Obama has any opportunity to name justices to the Supreme Court of our land, that he do so with our children in mind... to spare them an early death... and who will grant access once again to an education with our historic godly values for them. And name justices who will once again level the playing field among ALL strongly held beliefs... 'religious' or 'secular'... in the quest for human flourishment -- that is, that 'religious' values need not be checked at the public door, but rather, have an equal opportunity to be heard, seen and discussed in the public square and the public educational institutions. To do otherwise is to limit free speech, short-changing our children and grandchildren. And especially in the age of our growing government sector. I'll pray that he not laden our children and grandchildren with yet more national debt. I pray that he'll be the first to tell the nation's dirty-little-secret that any president can get by for 4 years if they have a money-printing-press. I pray that he'll shut down its excessive use, and that he balance the national budget just like all the rest of us have to. I pray that he'll bless those who are freely blessing our communities with their nonprofit services, including churches, ministries, heath-care units, food pantries, jobs-ministries, charter schools, housing, etc.... May he encourage even more such organizations to form, thru tax incentives and reduced government paperwork requirements. And not handicap the most effective ones -- the religious nonprofits -- by barring them from an equal footing as they compete for grants and other regulated activities. I pray that he'll be an advocate for families -- the families that God designed with a purpose. And I pray that President Obama will do everything possible to help families stay together, and be impactful in their neighborhoods. And I'll pray that he treat the alien with the same compassion that God commands him (and us) to do. I pray that Barack will initiate practical reform of our immigration system -- that he will immediately fingerprint and allow people who will swear allegiance to the values of our country... into the U.S. to work and pay taxes and to thrive here with their families intact... the dream of our fathers. And allow those who accumulate 5 years of working & paying taxes... to qualify for citizenship and the benefits thereof. Lastly, I'll pray that he frees us from a portion of the enslavement of working for the government without pay January thru May. In short, I'll pray that President Obama acts in accordance with the 'Christian faith' that Candidate Obama said he had. Here's the slideshow (so far) from our photostream. A Truck-load of Watermelons and T-bills. "What we need next time is a bigger truck!" I guess that's why I left the farm and went off to the big city to get a college degree in finance -- so I too could understand Keynesian economics. But I'm still having trouble explaining it to my dad. What's Better Than A Flat Tax? My Tax Plan. Why pay tax at all? The government can print money, right? So don't tax anyone. Just spend ourselves into oblivion, with no revenue stream. I'm surprised Presidents Bush nor Obama have thought of this before. Think about it. Today's April 15th -- NO TAX RETURN TO BE FILED. NO COMPLEXITIES. NO ARGUING OVER WHO PAYS THE MOST OR GETS THE MOST TAX-BREAKS! Moreover, we can spend to our national hearts content. But that's only fair. The amount that our dollars shrink in our wallets each night, is our effective tax-rate. Ok? But the beauty of it is, look at all the holders of our dollars around the world who also will effectively be paying tax too! The Chinese government, no less!